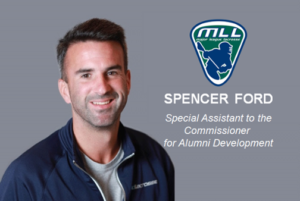 BOSTON, MA (December 3, 2018) – Major League Lacrosse (MLL) announced today the hiring of Spencer Ford as its first-ever Special Assistant to the Commissioner for Alumni Development. Ford, who currently serves and will continue to serve as the Vice President of Player Personnel for the league’s Atlanta Blaze, brings great institutional knowledge to this position. In his new role, Ford will develop initiatives and maintain lines of communication with the league’s alumni. 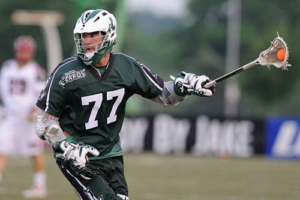 An attackman in MLL during its early seasons, Ford played for the Bayhawks, Rattlers, Lizards and Los Angeles Riptide during an eight-year career. He was named the league’s Most Improved Player in 2007, a season in which he set the single season record for assists (a mark that still stands). After an injury ended his career in 2009, Ford moved to front office work, flourishing as the general manager of the Bayhawks from 2010-2016, including overseeing three MLL Championship campaigns. 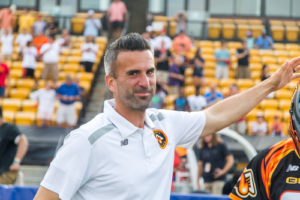 He then moved on to coach the expansion Atlanta Blaze in 2016, later becoming the team’s General Manager in 2017. The hiring of Ford as the league’s Special Assistant to the Commissioner for Alumni Development is just another significant change MLL has made during the 2018 offseason. Other changes have included: a shift of the schedule to a post Memorial Day start, beginning on Friday, May 31, 2019; an increase in the salary cap; an expansion of the game schedule; and an addition of one player to the game day active roster.